4D offers superior commercial real estate solutions to meet your current and future needs in the areas of office buildings, industrial space, land, retail, warehousing, flex space, and other property projects designed to assist buyers, sellers, landlords, and tenants. 4D engages in all stages of development – from acquisition, leasing, management, disposition or under construction – regardless of size and scope of project. We strive to deliver to each client the services and solutions that are personal to their specific needs. 4D provides exceptional assistance for requirements of any magnitude including office, warehouse, flex space and retail. Gary has been involved in commercial real estate in the Washington, D.C. and Baltimore areas since 1988. He started as a researcher for the Fred Ezra Company compiling leasing information for all office, flex and warehouse properties. He then joined Carey Winston (now Transwestern) where he represented landlords and tenants. Gary worked with large institutional landlords and local real estate developers, helping to lease office, flex, warehouse and retail properties. One of Gary’s primary responsibilities was the leasing of the Equitable Life Assurance Portfolio in Rockville, MD. This portfolio consisted of 600,000 sf of office and flex space. 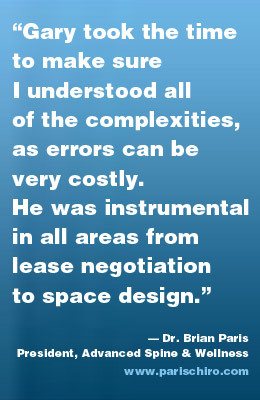 The portfolio was 20% leased when Gary was assigned to the leasing team. After two years, the property was 95% leased. Gary also represented tenants while at Carey Winston, completing on average over 50,000 sf of tenant rep transactions each year, with tenants ranging in size from 2,000 sf to 30,000 sf. In 1996 Gary joined the Penrose Group. Initially, Gary led the Corporate Real Estate Advisory company that Penrose operated, working with clients such as the American Red Cross and Hewlett Packard on their national real estate requirements. Gary then headed up the leasing team for the commercial properties that were part of the King Farm development in Rockville, MD. King Farm is a 430 acre mixed-use development that includes over 3,000 residential units, 750,000 sf of Class A office space and a Safeway-anchored 120,000 sf shopping center. Gary participated in the development of the office buildings and shopping center and oversaw the leasing for all commercial properties in King Farm. Gary was also actively involved in the property management of the commercial properties, interacting with tenants to ensure a positive experience and helping to implement management policies. Upon completing the leasing of the shopping center and office buildings, Gary then coordinated the disposition of the properties to institutional buyers. During Gary’s tenure at Penrose he also represented tenants throughout Washington, D.C. and Baltimore areas, completing approximately 20,000 sf of leases annually. In September of 2011, Gary formed 4 Dimensional Real Estate Solutions.